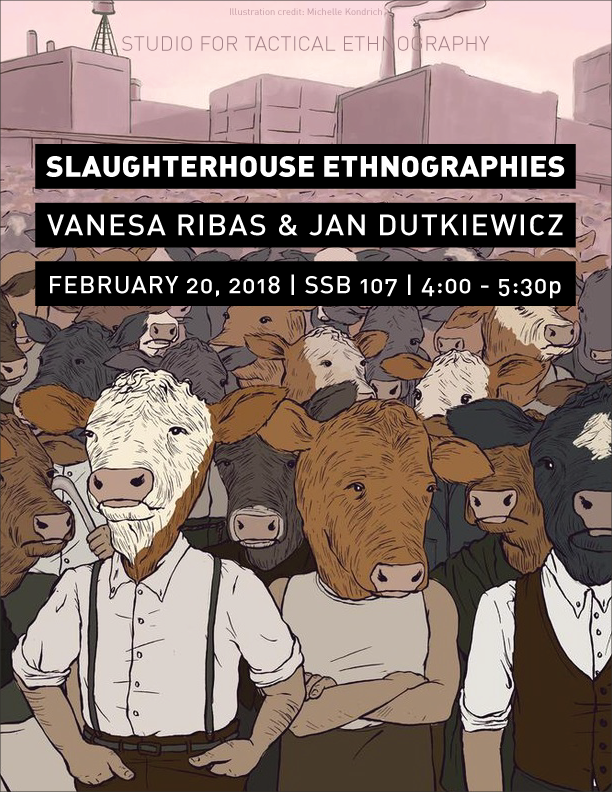 The Studio for Tactical Ethnography is hosting an event, Slaughterhouse Ethnographies: A conversation with Vanesa Ribas & Jan Dutkiewicz, on Tuesday, February 20th, 2018 from 4p – 5:30p in SSB 107. Close to ten billion animals are killed for their meat every year in the United States. Most of them live their lives unseen by the consuming public and meet their end in large-scale, high-speed slaughterhouses at the hands of an equally unseen and exploited workforce. In this conversation with Assistant Professor Christo Sims (UCSD Department of Communication), ethnographers Vanesa Ribas and Jan Dutkiewicz will discuss how modern abattoirs produce not only meat but also racialized laboring subjects. They will also discuss the political, epistemological, and ethical opportunities and challenges of conducting ethnographic studies of these violent, difficult to access spaces in the not-quite-postindustrial United States. Vanesa Ribas is an Assistant Professor in the Department of Sociology at UCSD. Her recent book, On the Line: Slaughterhouse Lives and the Making of the New South (University of California Press), is based on sixteen months of fieldwork in which she labored in an American slaughterhouse. Jan Dutkiewicz is a Dissertation Fellow at the Humanities and Social Change Center at UC Santa Barbara and a PhD candidate in Politics at the New School for Social Research. His dissertation project, Capitalist Pigs: The Making of the Corporate Meat Animal, is based on two years of multi-sited ethnography at sites throughout the American pork value chain.